I actually purchased a new desktop computer a while back without posting any details, so I thought I’d something similar to The Setup so that I have a record of what I’m using now. 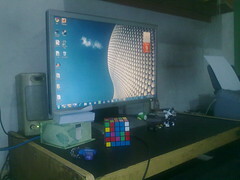 Desktop – my desktop is primarily for gaming, is a custom-built setup. Prepackaged and branded desktops aren’t really popular here in the Philippines, at least among techies. I actually had my brother put this one together, just gave him the budget and told him to maximize it. I also have a pair of crappy speakers – I have to adjust the connector every so often when watching eps because the voice tracks get filtered out for some reason. I have never solved that 5×5 Rubik’s Cube. My laptop is an Acer Aspire 4920G that I purchased around 2 years ago. 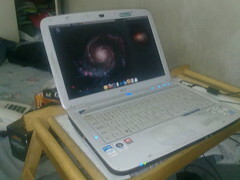 Core2 Duo 1.8GHz, 3gig ram, 160GB HD, ATI Radeon X2500 video card. It’s old and not really that portable – I seldom bring it outside the house, but it’s a workhorse and gets the job done. It’s my primary machine at home for random internet surfing and coding; I usually have it mounted on a breakfast tray (shown in the picture) so I can use while lying down on the bed. It can also act as a secondary gaming machine in a pinch, although it tends to overheat and crash if I use it for an extended gaming session. It’s an 80GB original model PS3 hooked up to a 22″ Samsung HD monitor. 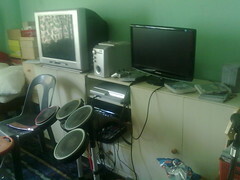 We have the Rock Band 2 set provided by chowtimer, plus a couple of arcade fight sticks for Street Fighter IV. There’s an SD-only TV beside the PS3, so we can usually watch whatever is on TV same time as playing PS3 games. My cellphone is a Nokia 5800. It’s handy and since I don’t text much most of my prepaid load gets eaten up by internet data usage when I’m outside of the house. It’s also my only camera, so I can’t take a picture of it. For mobile gaming I have a first-generation silver Nintendo DS and a purple PSP-3000. I have a couple of nonworking desktops lying around the house – we need to figure out what to do with them. The desktop runs Microsoft Windows 7 Professional, while the laptop dual-boots between Windows 7 Professional and Ubuntu 10.04, which is my primary OS for internet and coding.